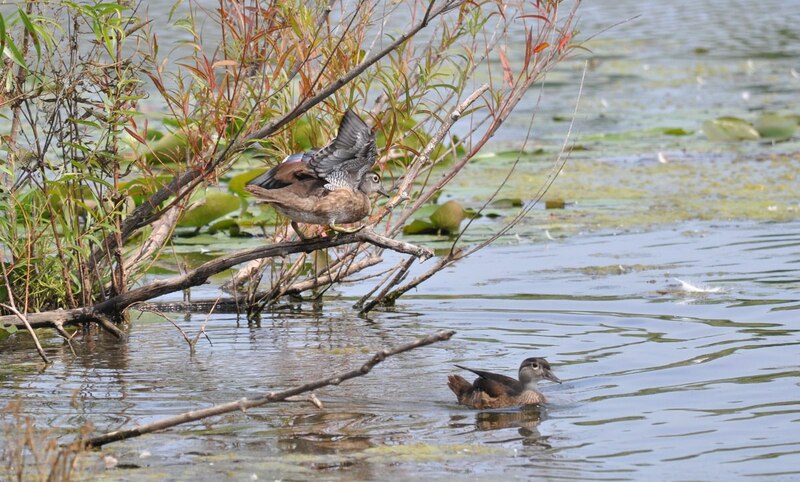 By word of a fellow Facebook member who frequents South Reesor Pond even more often than we do, Bob and I came to know about three young Wood Ducks that recently were relocated to this small body of water in northeast Toronto. We had occasion to photograph mature males and females at High Park in the spring, and very young hatchlings in Rouge National Urban Park a couple of years ago, so we were eager to observe a few juveniles. but when I rattled a container of cracked corn, they were enticed to come close and greet us. 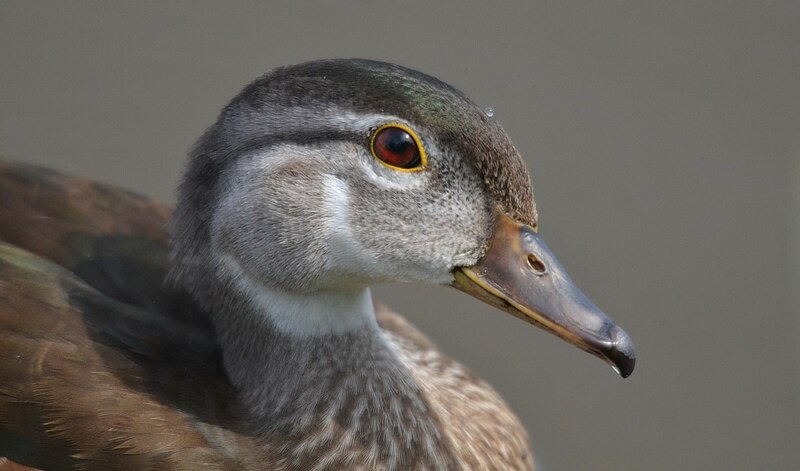 Also interested in the offering were some Mallard Ducks, but the Wood Ducks were nowhere to be seen. 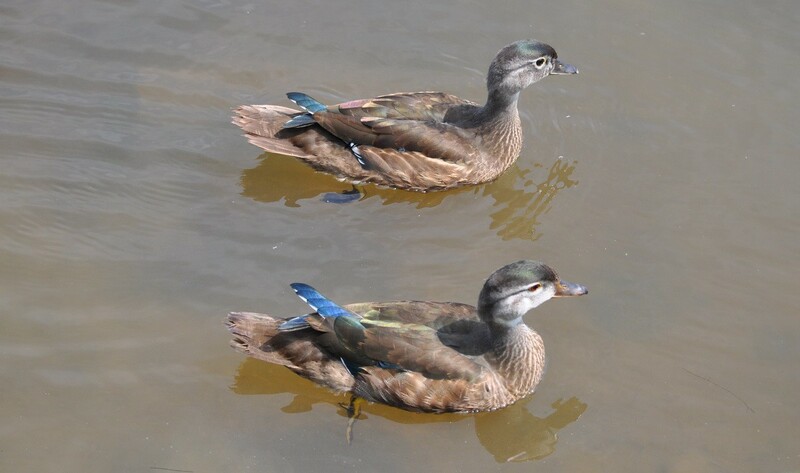 With binoculars held to our eyes, we quickly picked out a couple of the Wood Ducks near the middle of the pond where a partially submerged tree sticks well clear of the water. Two of the three juveniles were high and dry on a thick, weathered branch, but they began to show signs of activity. We vigorously shook the corn so the noise would carry across the water, and lo and behold, one of the Wood Ducks looked like it was preparing to jump in. 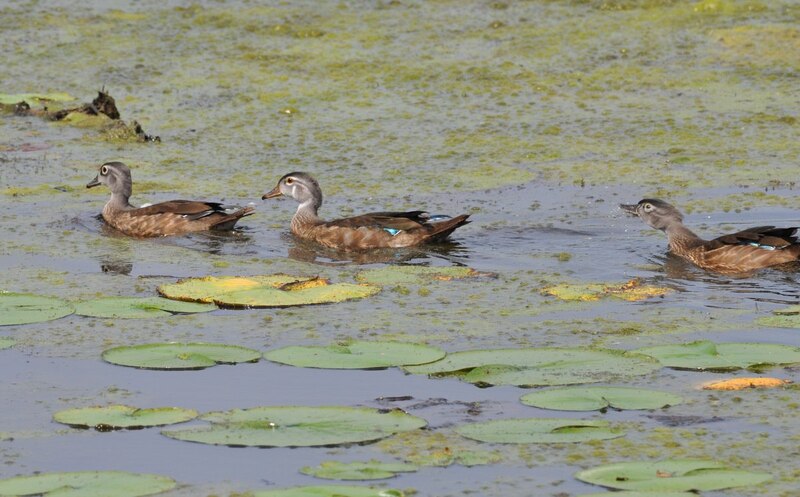 We still saw no sign of Wood Duck number 3.
where one goes, the others will follow, and, as if by magic, the invisible Wood Duck appeared out of nowhere to join the other two. By this point in time, the sound of the corn kernels clattering around in the paper cup held some interest for the three, and they approached us where we stood. I not only tossed some of the corn into the water, but based on observations of another birdwatcher from a day earlier who saw one of the Wood Ducks mount the muddy overhang onto the sandy point and proceed to reach up and harvest some Thimbleberries, I picked with difficulty some of the barely-ripe fruits growing nearby and flung them in the direction of the Wood Ducks, as well. With relish, they snatched up the juicy, red berries where they scattered and fell towards the soft bottom. 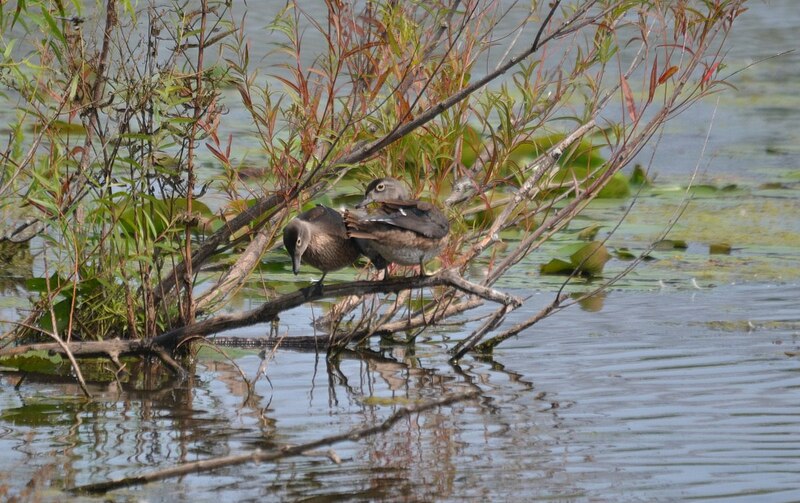 It was so nice to see that these juvenile Wood Ducks had settled into the rhythm of their new habitat. 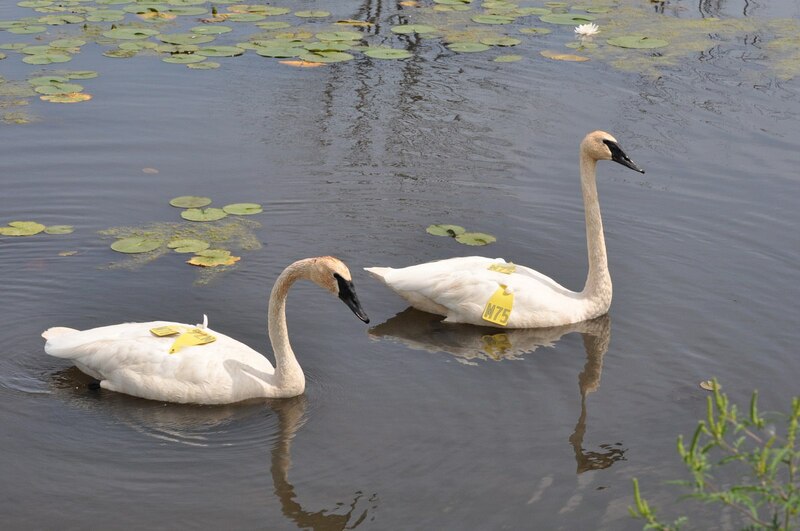 We have it on good authority that they had been rescued from the area affected by the Mimico Creek oil spill in mid-July 2015. 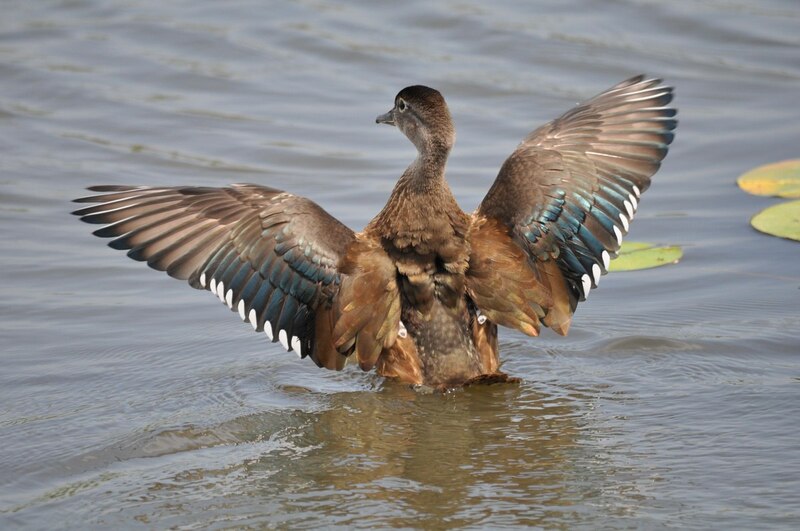 To look at their beautiful, iridescent plumage now, you would never know that they had been covered in some of the transformer oil that leaked from an overturned transport truck on Highway 401 a mere month earlier. 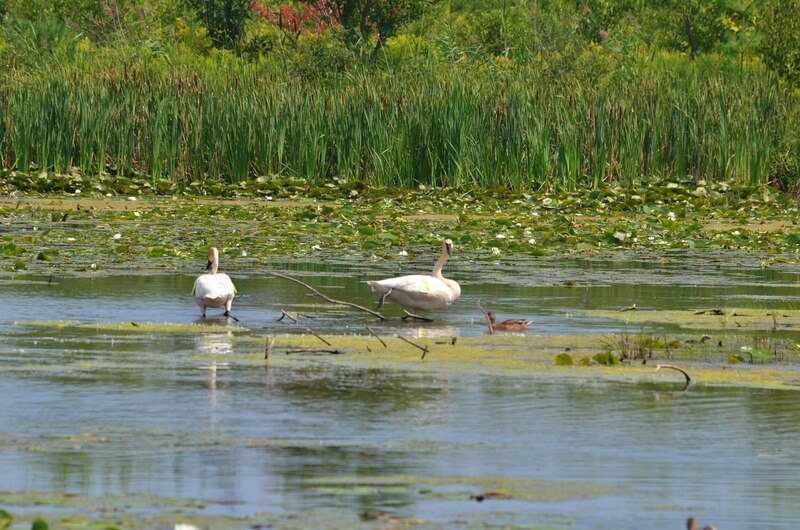 Staff and volunteers at the Toronto Wildlife Centre went into overdrive trying to deal with the scores of contaminated waterfowl that required washing and treatment before being considered for release back into the environment. 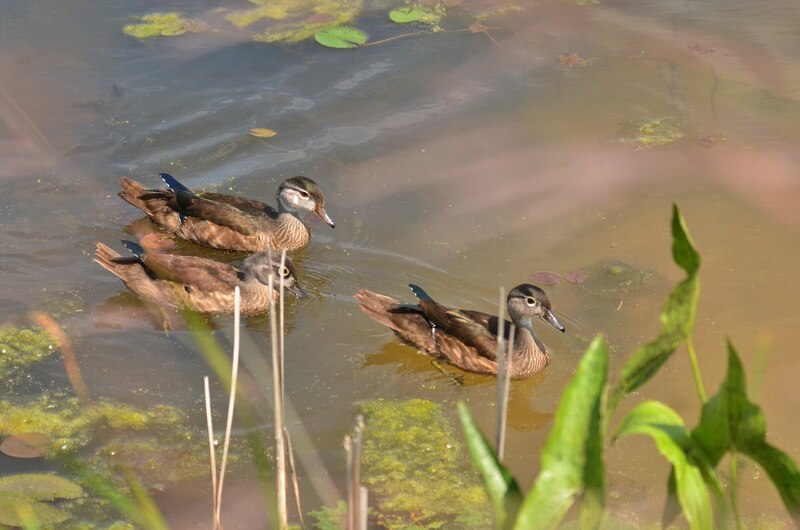 It was decided that these three Wood Ducks were best placed where someone could keep an eye on them. With wings spread wide, it’s as if this gorgeous specimen is saying thank you for all the hard work that gave it a new lease on life. 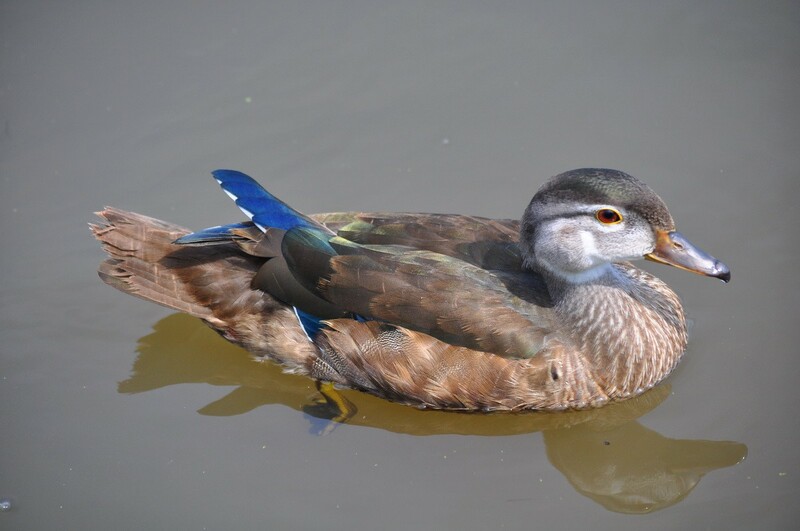 Bob and I are absolutely enamoured with the striking beauty of Wood Ducks. It is with gratitude that we thank the Toronto Wildlife Centre for the work that it does to give innocent creatures a fighting chance in the face of adversity that is no fault of their own. 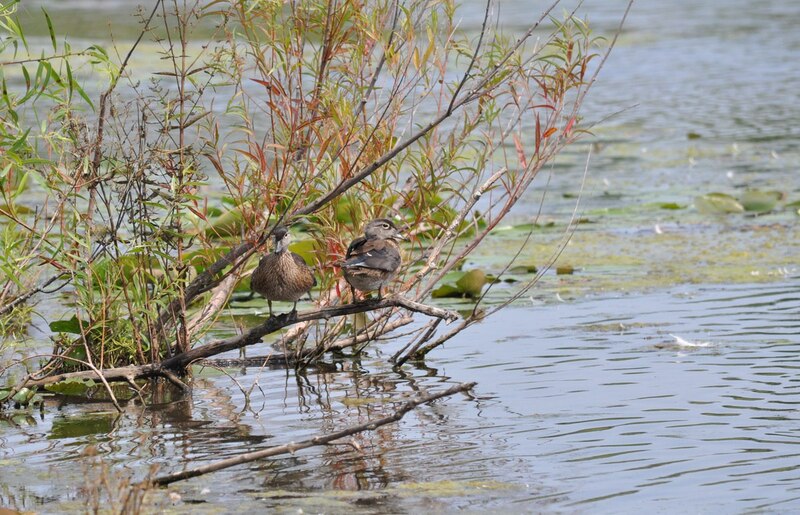 The trio of Wood Ducks is a welcome addition at South Reesor Pond. We can only hope that they return next summer to raise their own broods.